Don’t you just hate when you log onto a website and it takes forever to load? By the time the page is visible you’ve already decided to move on and try a different site. 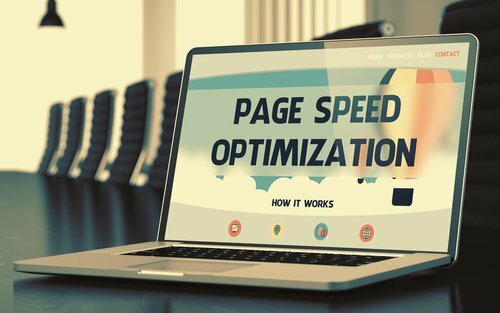 Having fast website loading speed is not only critical to attracting customers but it is also viewed as one of the most important aspects of Google’s algorithm to ranking well. Google PageSpeed Insights ranks both your desktop and mobile sites on a scale of 0/100 with a perfect score of 100/100 being the max. Here are some tips to help your website’s load time improve and hopefully get you closer to that perfect score. Websites nowadays are easier than ever to build with hundreds of widgets, plugins, and visual builders to choose from. The point of them is to make your job easier so that you can focus more on attracting people to your site. Although all those tools make building your website easier, they may be slowing you down if proper maintenance is not done. Always keep an eye on the lookout for updates to your website to make sure you are using the latest versions of plugins, widgets, and visual builders. There are circumstances where the theme of your website or certain parts may only be compatible with certain, prior versions of plugins and widgets but a general rule of thumb is to update your site often to keep it running smooth and fast. Every website has above-the-fold content. This is content that shows up directly on a page when it is first loaded. You should take extra time to make sure this content loads smoothly because it is the first thing visitors will see and as we all know, first impressions are important! Adding alt text to pictures and compressing data can help this part of your site load faster and should take precedent to other parts of your site loading. Implementing browser caching will allow your website to load quicker since it makes visitors download the data. Think of this as your device remembering the site so that next time you visit, it already has to data ready to load. All the downloads, images, HTML, CSS etc. will appear quicker and make your site speed faster. Some website hosting services already have browser caching put in place but if not, or you want to make sure your caching is working effectively, you can download plugins likes WP Super Cache or W3 Total to help. If you are having trouble with your Google PageSpeed, contact Boston Web Marketing today. With first-class SEO Specialists to help with page speed and all things SEO, you can have your site ranking better and drawing in more potential business. Contact Boston Web Marketing today at (857) 526-0096 or fill out a contact form.